NEW ROOF TO BE INSTALLED PRIOR TO CLOSING!! THIS HOME APPRAISED FOR $10,000 OVER LIST!! JUST WHEN YOU THOUGHT IT COULDNT GET ANY BETTER!!! MOTIVATED SELLER, ALREADY MOVED OUT! NEW PRICE, SAME BEAUTIFUL PLACE!!! WELCOME HOME TO AYLESFORD IN THE HEART OF THE HIGHLY DESIRED SUBDIVISION OF LANSBROOK! 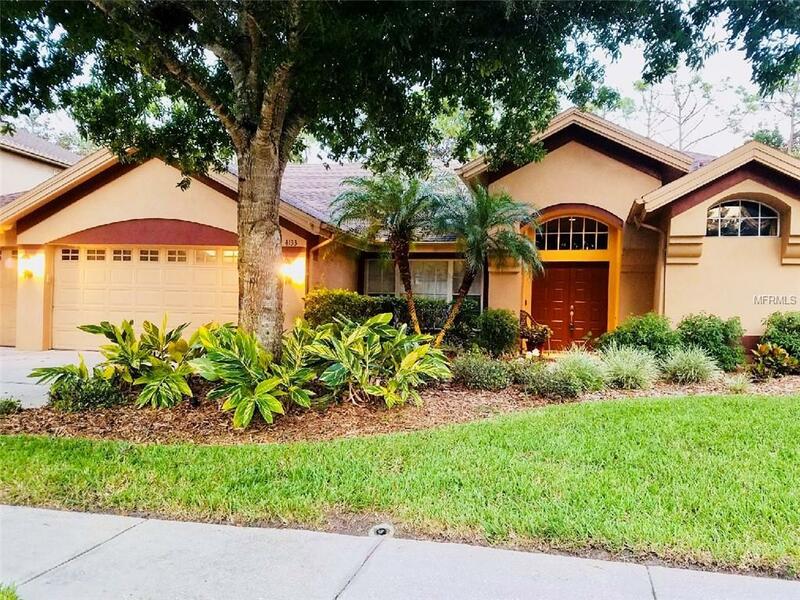 THIS FOUR BEDROOM, THREE BATHROOM HOME SITS IN A CUL DE SAC ON A CONSERVATION LOT, WITH EASY ACCESS TO THE PINELLAS TRAIL AND EAST LAKE ROAD, BOASTS AN UPDATED KITCHEN WITH HARDWOOD CHERRY CABINETS, GRANITE COUNTERTOPS AND STAINLESS APPLIANCES. KITCHEN AND FAMILY ROOM OPEN TO A RELAXING POOL AREA WITH PLENTY OF ROOM FOR ENTERTAINING. HOME IS DESIGNED WITH AN OPEN, SPLIT FLOOR PLAN; TWO BEDROOMS SHARE A JACK AND JILL BATHROOM, THE THIRD BEDROOM IS PERFECT FOR GUESTS WITH A PRIVATE BATH AND ACCESS TO THE POOL, WHILE THE MASTER BEDROOM IS BRIGHT AND ROOMY WITH TWO WALK IN CLOSETS, DUAL SINKS IN THE MASTER BATH, A SOAKING TUB PLUS A BEAUTIFULLY UPDATED WALK IN SHOWER. NEW A/C AND WATER SOFTENER IN 2016; NEW AIR HANDLER IN 2017; NEW HOT WATER HEATER IN 2015; GUTTERS, POOL LANAI AREA HAS BEEN RESCREENED AND ALARM SENSORS INSTALLED ON EXTERIOR DOORS. LOVINGLY CARED FOR AND YOUR PLACE TO CALL HOME. MAKE AN APPOINTMENT TO COME SEE THIS BEAUTY TODAY! YOU WONT FIND VALUE LIKE THIS IN LANSBROOK AT THIS UNBELIEVABLE PRICE! LOVELY HOME! Additional Water Information Beautiful Waterfront Community On Lake Tarpon With Boat Access Docks And Residents Also Have Access To Use The Pavilion On Site Along With Lansbrook Commons Equipped With Basketball And Volleyball Courts Swings And A Large Soccer Field.